Today I would like to take you to Anacortes – a small town in the state of Washington. 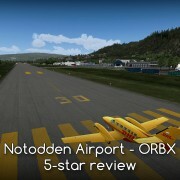 First, I want to show the local airport and the scenery made by ORBX. We will start at the airport, and then we will go on a trip around the island of Fidalgo to check what else the developer has prepared. 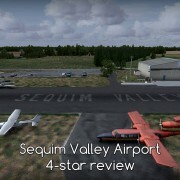 Interesting mostly to the pilots of small aircraft Anacortes Airport makes a good departure point for VFR flights. The 919-meter long and 18-wide runway is sufficient for most general aviation aircraft who will plenty of space to park their planes. Hangars accommodate planes based here – 49, including one jet. At all – together with transient traffic they perform nine thousand operations annually. A gas station in the middle of apron provides Avgas and Jet-A fuel. In the scenery, you will notice a guy working there but IRL it is self-service. 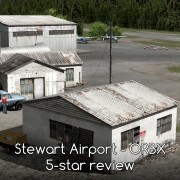 Despite impressive traffic statistics – it’s just a small airport with no IFR procedures. Presence of the city restricts its growth and imposes noise restrictions. They forbid touch and goes and recommend runway 36 for takeoffs and landings. Hill located east of the airport forces all traffic patterns to the western side – it is a left pattern to 36 and right to 18. 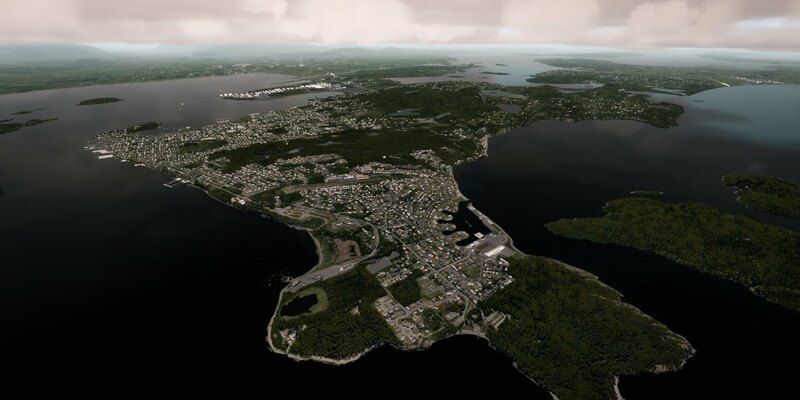 When flying – keep in mind the C-class airspace surrounding Whidbey Island Naval Air Station – some 7 miles south. Over Anacortes, it spans from 2000 to 4000 feet (AGL). The vicinity of the U.S. Navy means a lot of F-18 fighters. Orions and Poseidon ASW (Anti Submarine Warfare) patrol planes are also based there. The Anacortes shares airspace with the Skyline Marine Center seaplane airfield. 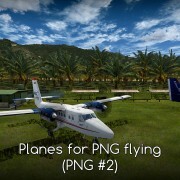 In the scenery, you can even find a plane parked near the fuel dispenser. In reality, it serves boats, not planes. With three operations a year, one is unlikely to find a moored Cessna in the marina which is not the easiest to navigate with a seaplane due to strong currents. Continuing the trip to the south we pay a visit to Burrows Island and Allan Island. To those arriving in a helicopter, they both make a destination worth a tour. Burrows Island features a helipad next to the lighthouse. The landing strip on Allan Island was, unfortunately, placed (in the scenery) on the rugged mesh and is too bumpy for aircraft operation. It is a pity – this place aroused my curiosity. At the southern end of Fidalgo Island, Bowman Bay tempts tourists. Popular among canoeists the bay is a setting stage for those who admire the landscape and look for encounters with whales and seals. Caution is advised in this area – on high tide, the current under the Deception Pass Bridge reaches nine knots and it is even stronger (at 10 knots) under the Canoe Pass. But no one promised it would be an easy place to kayak, and such conditions compose a good scenario for a possible rescue flight. You can then fly to the hospital helipad in Anacortes. 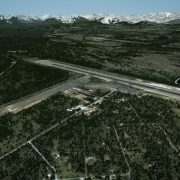 In the eastern part of the scenery, the developer made one more small runway – private Becker’s Landing. Unfortunately, the problems of Allan Island strip repeat themselves here – the strip, positioned on the scenery’s mesh does not allow for normal takeoffs and landings (too bumpy). Also, when I compared the layout of trees with satellite images, I had an impression they are too close to the airstrip which according to the documents should be 23 meters wide. Beside Becker’s Landing, a powerful refinery draws attention. Actually, there are two. Shell plant in the south and Marathon Petroleum in the north. Flying here the first time I noticed something unusual. Fuel tanks were empty inside – with collapsed or lowered roofs or no roofs at all. In fact, it looks like that in the real world. So a feature, not a bug. I return to the airport over the densely built city of Anacortes. Here marinas (and there are several) make me curious – why are there buildings in marinas (on the water I mean). And again – accuracy, not error. They covered piers with roofs. At 74S PAPI lights guide approaching aircraft (for both directions). If you forget to check the direction of the circle on the map – segmented circle and pattern indicator lay by the middle of the runway. Do not forget to tie down the plane after taxiing in. Developer placed neat little tie-down hooks in the pavement of parking. I did not say much about the airport itself. And that’s because the airport is perfectly correct. If I have any list of scenery features I am looking for, then in Anacortes, I can mark them all checked. Three-dimensional grass – checked. Accurate building models – checked. Textures – both on the ground and on the buildings – high res. Static aircraft – several, in various places at the airport. Animated people – both at the airport and around it. 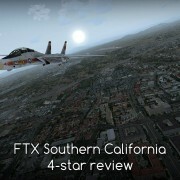 Buy the scenery in OrbxDirect system for 32,95 Australian dollars, or around 21 Euro (01.2019 exchange rate).